China’s Su-35 fighter jets participated in a joint combat patrol mission in the South China Sea area with its latest J-20 stealth fighters to maintain airspace safety in the new era, a military expert said Saturday. 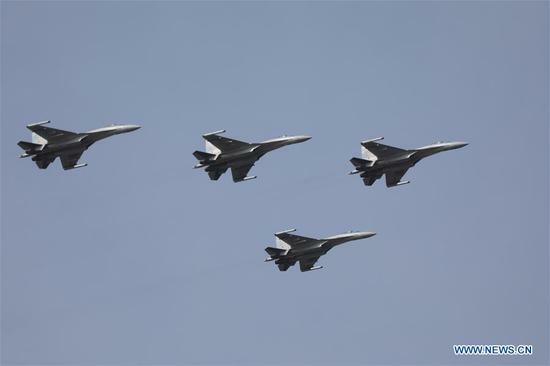 The People’s Liberation Army (PLA) Air Force announced on Wednesday that China has recently sent Su-35 fighter jets for a joint combat patrol mission in the South China Sea area. The deployment is expected to improve the air force’s adaptive capacity in complicated situation in the air and on the sea and enhance its ability to maintain national sovereignty and security and maritime interests in the South China Sea area, said Wang Mingzhi, a professor with the PLA Air Force Command Academy. The patrol mission is an annual training of combat readiness, embodying the air force’s resolution to implement mission in the new era and firmly maintain national sovereignty and security and maritime interests, Wang said in an interview with Xinhua. The air force will further increase real combat training on the sea and enhance the real combat capability especially under long-distance and high-sea conditions, he said. Wang said that the air force will often carry out patrol missions and normalize the patrol in the South China Sea area. The air force also announced that China’s latest J-20 stealth fighters have been commissioned into air force combat service. The J-20 signals that China’s air force has greatly increased its ability to deal with new security threats in airspace, and made steady progress in the aero equipment system, Wang said. The J-20 is China’s fourth-generation medium and long-range fighter jet. It made its maiden flight in 2011 and was first shown to the public at the 11th Airshow China in Zhuhai, Guangdong Province, in November 2016. Politics, Translations Fighter, Jet. permalink.